Royal National Park is the world's second oldest national park. Located along a stretch of coastline about an hour south of Sydney CBD — it's accessible via public transport from the city. Getting to The Coast Track from the centre of Sydney is really easy — and you don’t need a car to get there — simply take the train to Cronulla. Behind Cronulla train station is a wharf where you can take the ferry across to Bundeena. From Bundeena wharf it's a short walk through the village to the National Park. A great way to explore Royal National is via The Coast Track. The Coast Track stretches the length of Royal National from Bundeena to Otford. To walk the entire 26km coastal track generally takes two days (camping at North Era campground), but you can also tackle sections of the track as day walks. Bundeena to Marley Beach and back is a popular day walk in Royal National Park. If you’ve taken the ferry to Bundeena from Cronulla, you’ll spend the first part of your walk making your way through Bundeena to get to Royal National (it’s easy to find, chuck it in Google Maps and you’re good to go). Once on The Coast Track, the hike is an easy one along a well-maintained track, passing spectacular coastal scenery. From the Bundeena ferry wharf to Marley Beach is 5.4km, so return, you’re looking at an 11km hike. Be sure to pack a picnic lunch to enjoy while taking in the ocean view at Marley Beach before heading back to Bundeena. There's plenty to see in Royal National — rock pools, coastal cliffs, birds, wildflowers... the coast looking like the outback. The picture above was taken at a spot near Wedding Cake rock. The ocean is just beyond the rocks, but there's a certain outback aesthetic to the colours and textures, and that's what I love about the Coast Track — there's lots of different types of beauty. The sweeping ocean views are magnificent, for sure, but the way the rocks and scrubby coastal plants transform in the changing light of the day is just as special. The hike from Bundeena to Marley Beach on The Coast Track in Royal National Park is an easy day hike of approximately 11km. Marley Beach in Royal National Park. 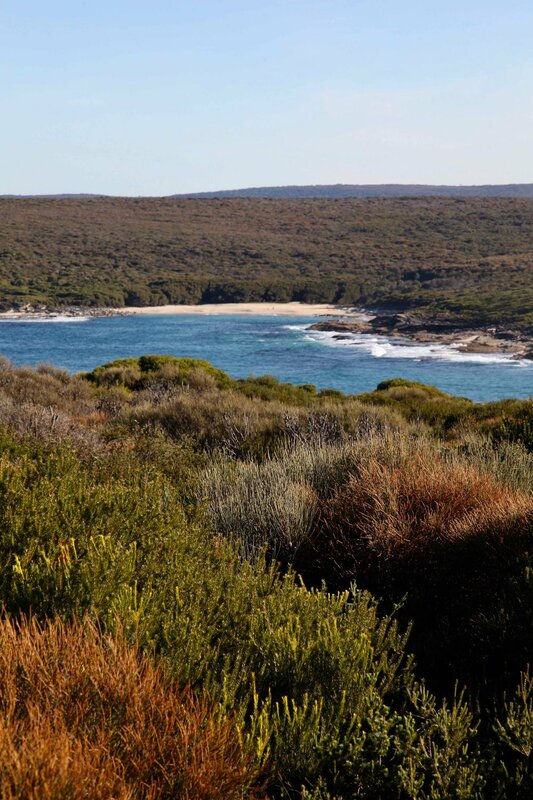 Hike from Bundeena to Marley Beach on the Coast Track and enjoy a picnic overlooking the ocean. If you time your walk right you can wander the coastline in golden hour light. Take in sunset from Bundenna wharf: don’t miss the last ferry back to Cronulla!